The Konawaena murals program is currently involved in three public murals. The Interactive Water Wings mural will be displayed this August, more to come about this new mural. The mural honoring the legacy of Col. Ellison Onizuka will be completed in the fall of 2017. The 1001 Origami Crane tile mural will be on going for the next school year. If you would like to paint a tile of goodwill for the 1001 Origami tile mural or help donate to the mural please contact Michelle Obregon at mobregon@konawaenahigh.k12.hi.us . 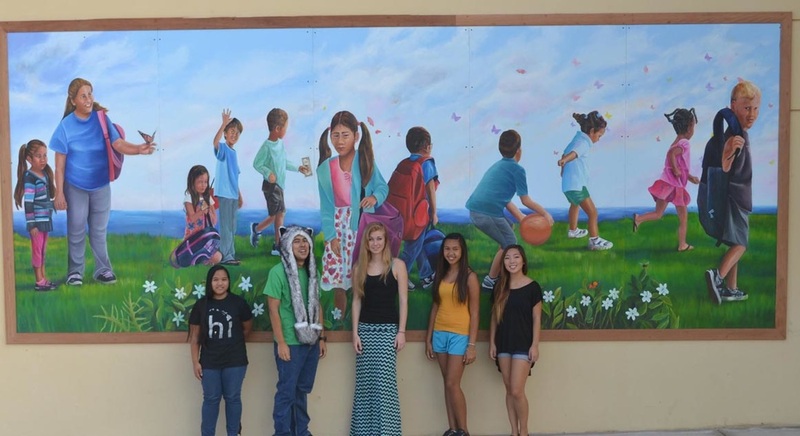 Konawaena HS invites you to take a selfie in front of the schools first interactive mural on campus. Located in front of the pool, the mirrored waves gives everyone a chance to be part of the mana of the ocean without getting wet! Goal: To create 1001 ceramic tiles with images of origami cranes and messages of good will. The finished mural will be a reminder to promote peace in our community. In April 2016, youth started painting their individual tiles with messages of good will. One of the three main murals was installed in May of 2016, which symbolized family. In 2017 the second main mural was installed, symbolizing community, and in the spring of 2018 self was displayed. Above: Students, staff and volunteers have all contributed their messages of goodwill on individual hand-painted tiles. The mural will be on-going for the next two years. There are three main panels symboling family, community and self. Above: Keisha Colon designed and students helped to paint the new mural on campus honoring the legacy of Col. Ellison Onizuka. The Mural depicts part of Ellison's keynote commencement speech he delivered to the class of 1980 at Konawaena HS. The mural will be complete in September 2017. For more information about his speech please visit ​http://onizukamemorial.org/his-message. Living Museum Mural: Captures history of Konawaena HS from it roots in Agricultural to current technologies. Complete Sprint 2015 .